Fire crews raced to the scene on of the blaze on Victoria Road, Torry at around 5.10am. A man was rescued from an Aberdeen flat after it went up in flames in the early hours of the morning. Emergency services raced to the scene on Victoria Road, Torry at around 5.10am on Saturday. 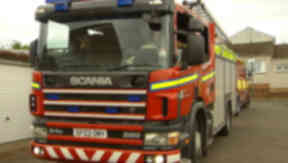 The man was pulled from the flat as three fire crews battled the flames. An ambulance crew was also in attendance. The man is not thought to have received major injuries.